I hope you all have a fantastic Memorial Day Weekend! If you missed the May 27 broadcast you can download the free archive by clicking here. (The songs from that episode are listed at the bottom of this post.) Also, WMFO just rolled out their summer schedule and Easy Ed's Variety Hour will remain in the usual time slot--alternating Fridays from 6:00 to 8:00 PM Eastern. Yeah! 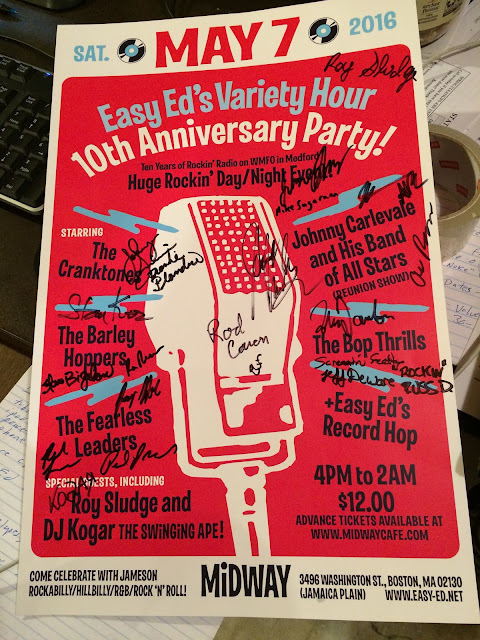 Johnny Carlevale very thoughtfully had all the bands sign this poster for me. I'll hang on to it forever! Huge thanks to everyone who came out to our tenth anniversary celebration at the Midway on May 7—the bands, DJs, dancers, and all my fellow fans of great rockin’ music. You brought the party, and what a party it was! To my radio show listeners who were able to come: I know that some of you traveled far to attend, and I was truly blown away to see so many of you at the Midway. Without you, none of this would be happening. Thank you! The bands were fantastic. It killed me to be the schedule keeper, because I wanted everyone to just keep playing. 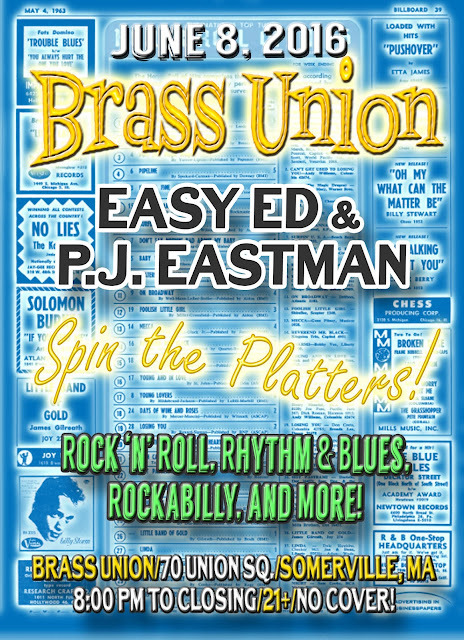 Sending tremendous gratitude to The Fearless Leaders, The Barley Hoppers, Roy Sludge, The Bop Thrills, The Cranktones, Johnny Carlevale and His All-Stars, and Amy Von E. Thanks to Kogar and Jesse Dee for your great DJ sets! (Side note: The DJ table was set up on stage. Thirty plus musicians and their gear moved on and off that stage during the event and not one record skipped the whole time. During Johnny’s set there were nine performers on stage and no one even came close to bumping the turntables. You guys are pros.) Special thanks to Johnny Carlevale for all the work he put into this show—helping me plan and promote, manning the soundboard, and much more. Thanks to Jay Balerna and the Midway staff for their hospitality and ongoing support of our live events. 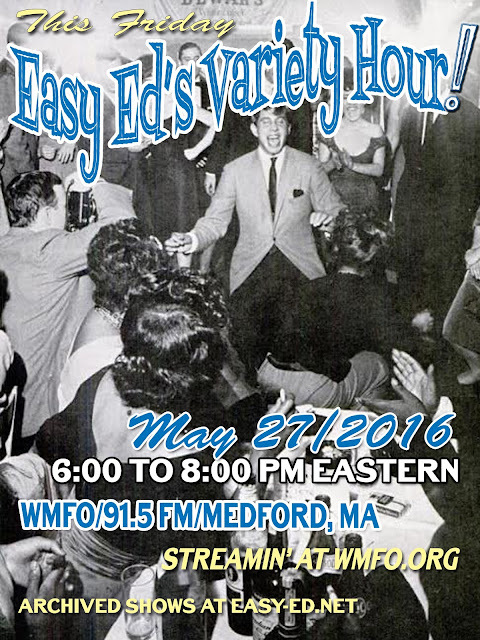 Thanks to WMFO in Medford for keeping “Easy Ed’s Variety Hour” on the schedule for ten years. Kathy Wade designed a beautiful poster for the event—thank you, Kathy! Finally, thanks to my lovely wife Beth, who supports everything I do and has fun doing it—even when it means unpacking the car at 3:00 AM on Mother’s Day. We'll have another radio broadcast for you in two weeks. In the meantime, if you're local, you can find me on June 8 at Brass Union in Somerville, MA, where I'll be spinning records with my good buddy P.J. Eastman. 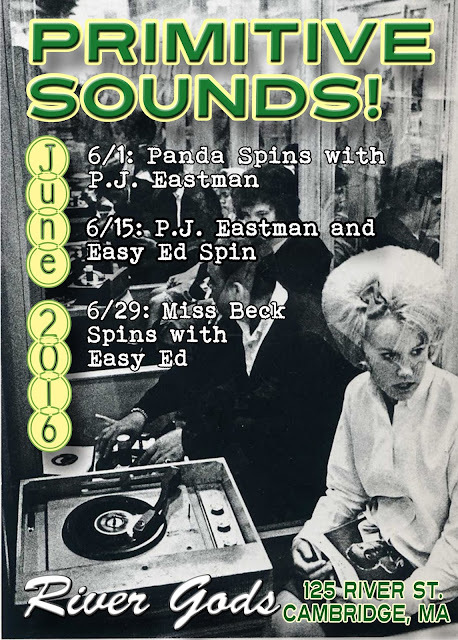 Finally, here's the June 2016 schedule for Primitive Sounds, our long-running DJ night at River Gods in Cambridge, MA.